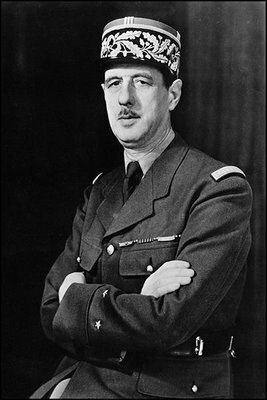 Charles Andr� Joseph Marie de Gaulle was a French general and statesman who led the Free French Forces during World War II. He later founded the French Fifth Republic in 1958 and served as its first President from 1959 to 1969. A veteran of World War I, in the 1920s and 1930s de Gaulle came to the fore as a proponent of armoured warfare and advocate of military aviation, which he considered a means to break the stalemate of trench warfare. During World War II, he reached the temporary rank of Brigadier General, leading one of the few successful armoured counter-attacks during the 1940 Fall of France, and then briefly served in the French government as France was falling. He escaped to England and gave a famous radio address in June 1940, exhorting the French people to resist Nazi Germany and organised the Free French Forces with exiled French officers in Britain. He gradually obtained control of all French colonies�most of which had at first been controlled by the pro-German Vichy regime�and by the time of the liberation of France in 1944 he was heading a government in exile, insisting that France be treated as an independent great power by the other Allies. De Gaulle became prime minister in the French Provisional Government, resigning in 1946 due to political conflicts. After the war he founded his own political party, the RPF. Although he retired from politics in the early 1950s after the RPF's failure to win power, he was voted back to power as prime minister by the French Assembly during the May 1958 crisis. De Gaulle led the writing of a new constitution founding the Fifth Republic, and was elected President of France, an office which now held much greater power than in the Third and Fourth Republics. As President, Charles de Gaulle ended the political chaos that preceded his return to power. A new French currency was issued in January 1960 to control inflation and industrial growth was promoted. Although he initially supported French rule over Algeria, he controversially decided to grant independence to that country, ending an expensive and unpopular war but leaving France divided and having to face down opposition from the white settlers and French military who had originally supported his return to power. De Gaulle oversaw the development of French atomic weapons and promoted a pan-European foreign policy, seeking independence from U.S. and British influence. He withdrew France from NATO military command�although remaining a member of the western alliance�and twice vetoed Britain's entry into the European Community. He travelled widely in Eastern Europe and other parts of the world and recognised Communist China. On a visit to Canada he gave encouragement to Quebec Separatism. During his term, de Gaulle also faced controversy and political opposition from Communists and Socialists. Despite having been re-elected as President, this time by direct popular ballot, in 1965, in May 1968 he appeared likely to lose power amidst widespread protests by students and workers, but survived the crisis with an increased majority in the Assembly. However, de Gaulle resigned after losing a referendum in 1969. He is considered by many to be the most influential leader in modern French history. How can one conceive of a one-party system in a country that has over 200 varieties of cheese?